West Windsor, NJ – The Princeton National Rowing Association’s Mercer Rowing Club won nine gold medals in Saint Catharines, Ontario at the 133rd Royal Canadian Henley Regatta, the premier summer event for amateur rowers in North America. The club’s performance topped last year’s five gold medals in junior events and was an appropriate send-off for Ted Sobolewski, PNRA/Mercer program manager and girl’s coach. Sobelewski will leave the club to assume the role of Associate Head Coach for Men’s Rowing at Northeastern University. “We wanted to perform well because this was our last regatta with Coach Ted,” said co-captain Kate Hickey (Yardley, PA). The girls won Henley gold in seven of the nine events they entered. “Coach Ted will be greatly missed by the entire program, but thanks to the environment of hard work he fostered, and the high expectations he instilled in us, PNRA/Mercer will continue to be a strong contender on the national level,” said co-captain Caitlin Cleary (Princeton, NJ). 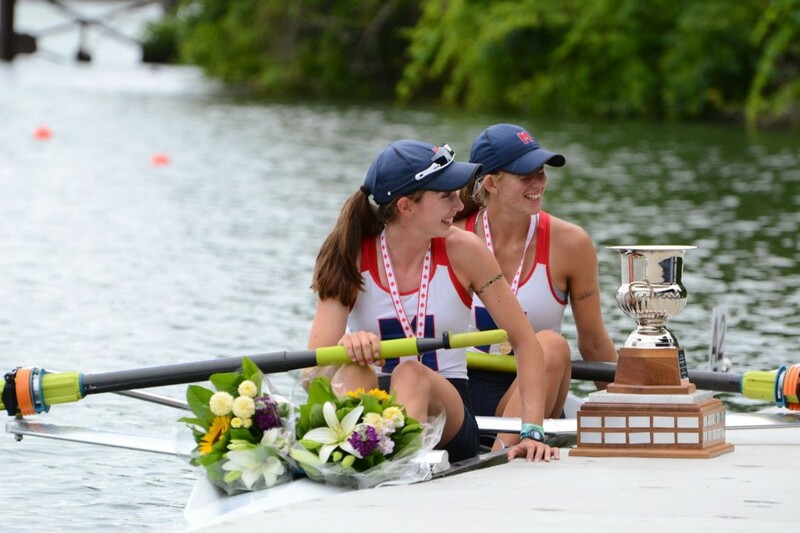 “Coach Ted first brought us to Canadian Henley in 2013, and we didn’t win any events that year. He believed in us, and we improved a lot because of his coaching and training plans. Now we love this regatta because we get so many opportunities to race great competitors,” added Hickey. With heats, semi-finals and finals, some of the girls had fourteen races over the five days of the regatta. U17 Men’s 8 with coxswain – Daniel Stoddard (West Windsor, NJ), Andrew Hickey (Yardley, PA), Erik Wicks (Holmdel, NJ), Philip Collins (Lawrenceville, NJ), Jack Gallagher (Newtown, PA), Andrew Moss (Princeton, NJ), Brian Karp (Princeton, NJ), Tyler Harris (Princeton Junction, NJ) and coxswain Katelyn Takacs (Lawrenceville, NJ).